Did you know that The American Dental Association recommends that a child’s first visit to a dentist should occur around twelve months of age? For many parents in the Goleta, Montecito, and Santa Maria area, this may come as a surprise. Today in the King Dental Group post, we are going to review 4 reasons why your toddler’s teeth are worth a dental visit. 1. Twelve months of age happens to be about the time when a child’s first teeth tend to erupt. Once those teeth are out, it’s time to get them looked at by a professional. 2. One of the most important things your Montecito or Santa Maria dentist will do at this visit will be to clean those young teeth and apply fluoride. 3. 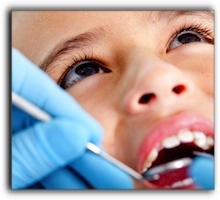 Visiting the dentist at a young age is a great way to help your child get used to the dentist’s office. This will help them to be more comfortable with the dentist as they grow older. 4. Visiting the dentist also helps parents enlist the help of other adults in establishing good dental habits in their children. Starting early dental visits will mean that later in life your child is less likely to require braces or other cosmetic dentistry procedures such as dental implants. If your child is apprehensive about visiting the dentist, you might want to bring them for a short tour of our office beforehand. They can meet our friendly staff and learn what to expect when they come in for their exam. I’m Dr. Jon King, of Santa Barbara. I want my patients to have the best oral health possible. I also want them to look their best, so if you have any questions about a smile makeover or other cosmetic dentistry procedures, contact my caring, family-oriented dental team at 805-687-1548.